Implementing a new curriculum is always subject to a new set of challenges. References are not always available, and training may be too short to cover all the required topics. Under these circumstances, providing teachers with quality resource materials aligned with the curricular competencies may be the best strategy for delivering the expected learning outcomes. Such is the rationale for creating a series of teaching guides for several Grade 11 and 12 subjects. The intention is to provide teachers a complete resource that addresses all expected learning competencies, as stated in the Department of Education’s official curriculum guide. mathematics, and logic. Each lesson begins with an introductory or motivational activity. The main part of the lesson presents important ideas and provides several solved examples. Explanations to basic properties, the rationale for mathematical procedures, and the derivation of important formulas are also provided. The goal is to enable teachers to move learners away from regurgitating information and towards an authentic understanding of, and appreciation for, the subject matter. The chapters on functions are an extension of the functions learned in Junior High School, where the focus was primarily on linear, quadratic, and polynomial functions. In Grade 11, learners will be exposed to other types of functions such as piecewise, rational, exponential, and logarithmic functions. Related topics such as solving equations and inequalities, as well as identifying the domain, range, intercepts, and asymptotes are also included. The chapters on business mathematics in Grade 11 may be learners’ first opportunity to be exposed to topics related to financial literacy. Here, they learn about simple and compound interest, annuities, loans, stocks, and bonds. These lessons can hopefully prepare learners to analyze business-related problems and make sound financial decisions. The final chapter on logic exposes learners to symbolic forms of propositions (or statements) and arguments. Through the use of symbolic logic, learners should be able to recognize equivalent propositions, identify fallacies, and judge the validity of arguments. The culminating lesson is an application of the rules of symbolic logic, as learners are taught to write their own justifications to mathematical and real-life statements. This Teaching Guide is intended to be a practical resource for teachers. It includes activities, explanations, and assessment tools. While the beginning teacher may use this Teaching Guide as a “script,” more experienced teachers can use this resource as a starting point for writing their own lesson plans. In any case, it is hoped that this resource, together with the Teaching Guide for other subjects, can support teachers in achieving the vision of the K to 12 Program. This work is licensed under a Creative Commons Attribution-NonCommercial-ShareAlike 4.0 International License. No changes have been made. Hello po. SHS math teacher po ako here sa cam sur. im trying to download the gen math teaching guide. lagi po siyang error. is there a way i can find the pdf file here in the region? I would like to express my hearrfelt gratitude for your sincerest effort in creating this page for us to lighten the burden in looking for references to be used. I am looking forward for more post especially on Disciplines & Ideas in Social Sciences reference. Hope you will not tired of doing good for the benefits of others! downloading the teaching plan took me one week. it’s only now that i succeed. It’s late because i went too far from the first lesson. I need to go back. I lectured on asymptotes but it’s not included in here. 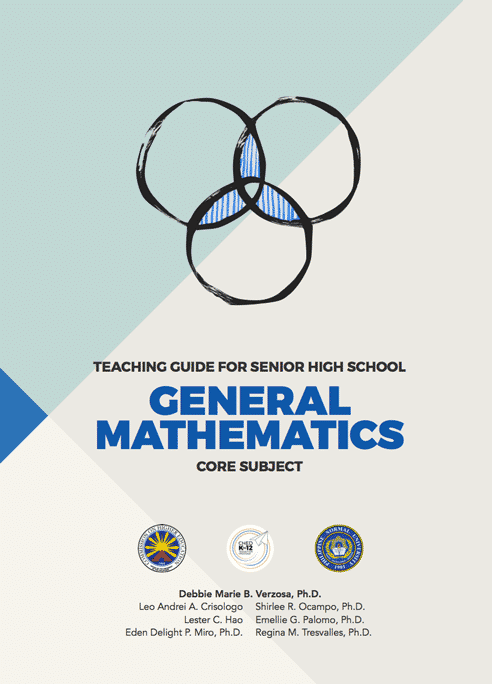 sir, bakit po hindi madownload yung TG ng general mathematics? lagi pong failed.